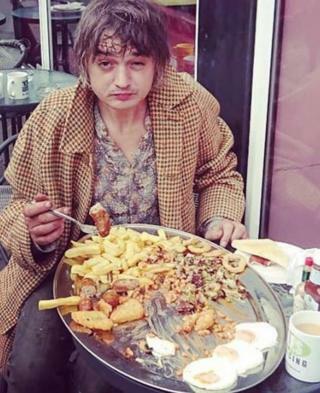 Libertines frontman Pete Doherty will have his name inscribed on a wall of fame in a Margate cafe after scoffing a "mega breakfast" to claim it for free.He put away the feast inside 20 minutes to beat the challenge set by cafe owner Mark Ezekiel.The fry-up included four bacon rashers, four eggs, four sausages, a burger and chips, plus plenty of trimmings.The "Can't Stand Me Now" singer is well-known in the Kent town where the band are building a studio and hotel. "He had his dog with him, that's why he sat outside," Mr Ezekiel said. "We said 'you can't feed your dog or the challenge is void'. "He said it's a However, Mr Ezekiel said only some of the breakfast - which he estimates contains about 4,000 calories - was fried. The cafe owner said Doherty was a regular in the area, but this was his first visit to the cafe. "People chat to him and he's very friendly," Mr Ezekiel said. "He's really down to earth. Even my sister bumped into him walking his dog." The cafe's "beast of a breakfast" menu comprises four eggs, four bacon rashers, four sausages, a quarter-pound burger, hash browns, mushrooms, chips, onion rings, bubble and squeak, two slices of thick bread and a choice of beans or tomatoes.Diners also get a mug of tea or coffee to wash it down, although Mr Ezekiel said Doherty also had a strawberry milkshake. On Facebook, Mr Ezekiel wrote: "He came, he saw, he conquered, smashed it in 19.30 minutes. "And he added: "He was pretty chuffed. "The Libertines recently became the main shirt sponsors for non-league football side Margate FC, which will have the band's logo on its home and away shirts.The indie rock band, who were once known for their notoriety as much as their music, originally formed in London in 1997.